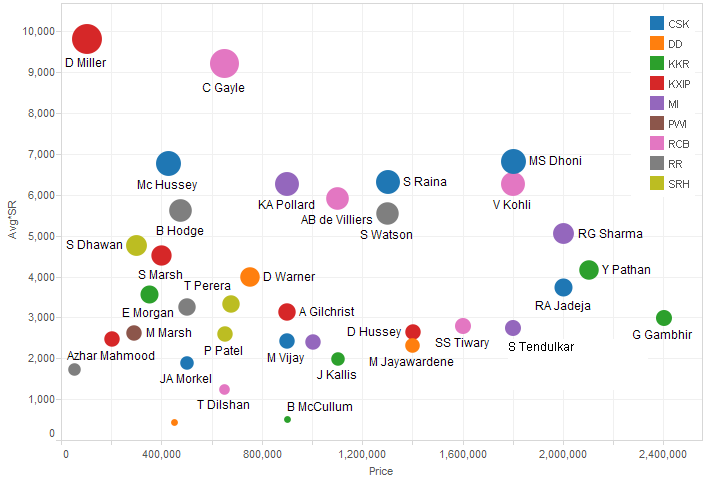 The map below captures the money paid (including retentions) for the top 7 players in each team during the last IPL season. Rectangles are sized according to the auction money. Colours represent the different teams. KKR and MI spent the highest for auctioning the top 7 players for their team (8,175,000 USD and 7,800,000 USD respectively). This money is at least 2.5 times higher than the money spent for buying the top 7 players in RR team (3,425,000 USD). Here's a snapshot view of the total money spent by each team. For details of money paid for the top 7 players in each team is please refer to the Table 1 at the bottom of the page. Tired of finishing in the lower half of the table, Kolkata Knight Riders went on a major offensive in the 2011 Player's Auction and invested heavily in the likes of Gautam Gambhir (2.4 million USD), Yusuf Pathan (2.1 million USD) and Jacques Kallis (1.1 million USD) as some of their major players. Their investments paid rich dividends as the Shah Rukh Khan-owned outfit went on to win the Indian Premier League title a year later, in 2012. For details of money paid for the top 7 players in each team vis-a-vis their performance please refer to the Table 2 at the bottom of the page. Here you can see there are players like Gayle and Hussey who are auctioned for less money but show superior performance, whereas players like Gambir, Uthappa, Sehwag who are auctioned for much larger sums of money show relatively less impressive performance. Some teams like CSK, RCB and RR seem to be picking good performing batsmen for a relatively cheaper price, whereas teams like PWI, MI seem to pick mediocre batsmen for a mega price. Chris Gayle is one of the most amazing stories in IPL. Unbelievable as it may seem, Gayle went unsold in the 2011 Players Auction before Royal Challengers Bangalore got him as a replacement player for Dirk Nannes, who cost them 650,000 USD. Gayle took the T20 tournament by storm, hitting 608 runs in 12 matches at an average of 67 with two centuries and two fifties. In the 2013 edition of the IPL, the tall West Indian smashed a world record 175 not out from 65 balls against Pune Warriors, hitting 17 sixes and 13 fours and getting to his century from a mere 30 balls in the process. Little-known David Miller came in very cheap for Kings XI Punjab as he was retained for $100,000 in 2012 but made a major impact last year with his superlative work with the bat. The South African left-hander was Punjab's highest run scorer in the IPL last year with a tally of 418 runs, which also included a 38-ball century against Royal Challengers Bangalore, the third fastest of the tournament. Australian Mike Hussey is another big IPL hit because of his consistent performances with the bat for Chennai Super Kings. He was purchased by CSK for 425,000 USD in 2011 and the veteran batsman has been worth every penny, scoring 1,691 runs in 46 matches at an average of 44 in the five seasons of IPL he has featured in so far. The now-defunct Pune Warriors paid a massive 2.1 million USD for the services of Robin Uthappa in 2011 but he failed to justify his price tag. He made 264 runs at an average of 26 in 2011, 405 runs at 27 in 2012 and 434 runs at 21.12 last year in a below-par performance by his standards. The performance was disproportionate to the huge price paid for him by his franchise owners. Virender Sehwag is also another player who has struggled to establish himself in the T20 format and averages a modest 29 in his six seasons, for Delhi Daredevils. Chennai Super Kings retained most of their top players before the 2011 Auctions and didn't have to spend much at the auctions. But on the other hand, Mumbai Indians invested heavily to get the likes of Rohit Sharma (2 million USD), Andrew Symonds (850,000 USD) and Munaf Patel (700,000 USD). Similarly, Kolkata Knight Riders splurged a lot to get their hands on top international players like Gautam Gambhir (2.4 million USD), Yusuf Pathan (2.1 million USD) and Jacques Kallis (1.1 million USD). Disclaimer: For players who were retained, values have been calculated based on the amount deducted from the team's auction kitty.